Elizabeth J. Guell, 94, a resident of St. Francis Terrace, passed away peacefully on Saturday, January 26, 2019. Betty was born on June 24, 1924, a daughter of William and Pauline Ann (Kaiser) Andrew. Betty married Gerald M. Guell on October 23, 1943. Betty was a 1942 graduate of Fond du Lac Senior High School. She worked briefly for AT&T as an operator until she got married and worked on the farm as a homemaker. After the passing of her husband in 1962 Betty sold the farm on Rogersville Road and moved into the city of Fond du Lac. She was then briefly employed with Woods Floral, Service Motors and then back to AT&T until her retirement. 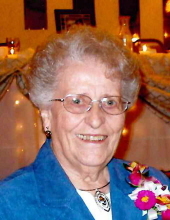 Betty was a volunteer at St. Francis Nursing Home, a member of Holy Family Parish, a choir member at St. Mary Church, and a member of the Daughters of Isabella. She was also an avid sports fan of the Milwaukee Brewers and the Green Bay Packers. Family and faith were very important to Betty. She greatly loved and enjoyed her time with family and in prayer to the Lord. Preceding Betty in death are her parents, Gerald her husband, one son, David; brother Gilbert Andrew; four sisters Lucille Andrew, Estelle Redding, Kay Andrew and Agnes Losch. Betty is survived by one daughter, Judith Miller of Fond du Lac, two sons, Thomas (Mary) Guell of Ripon and Mark (Eileen) Guell of Slinger; daughter-in-law, Cathy Guell of Fond du Lac; one sister, Helen Cutler of Fond du Lac; six grandchildren, Jerrie, Paul, Todd, Brenda, Erin and Julie; five great grandchildren, Thomas, Daphne, Luke, Blake and Hattie; nieces, nephews, other relatives and friends. The family will receive relatives and friends on Friday, February 1, 2019, at Sacred Heart Catholic Church, 200 S. Peters Avenue, Fond du Lac, from 9:00 AM until 10:45 AM. A Mass of Christian Burial will be celebrated at 11:00 AM at Sacred Heart Church. Burial will be in Calvary Cemetery, Fond du Lac. Betty’s family is grateful to the staff at St. Francis Terrace for their loving care of Betty and her family. Memorial donations may be directed to the family who will forward them to a charity in her name. "Email Address" would like to share the life celebration of Elizabeth J Guell. Click on the "link" to go to share a favorite memory or leave a condolence message for the family.